It's almost New Year's Eve and that means that everyone will be donning fun party wear! For women, that usually involves sequin dresses. While sequin dresses are stunning, they're not exactly the most practical thing to wear on days other than New Year's Eve. Instead, I'm opting for a dress that can be worn all year long! 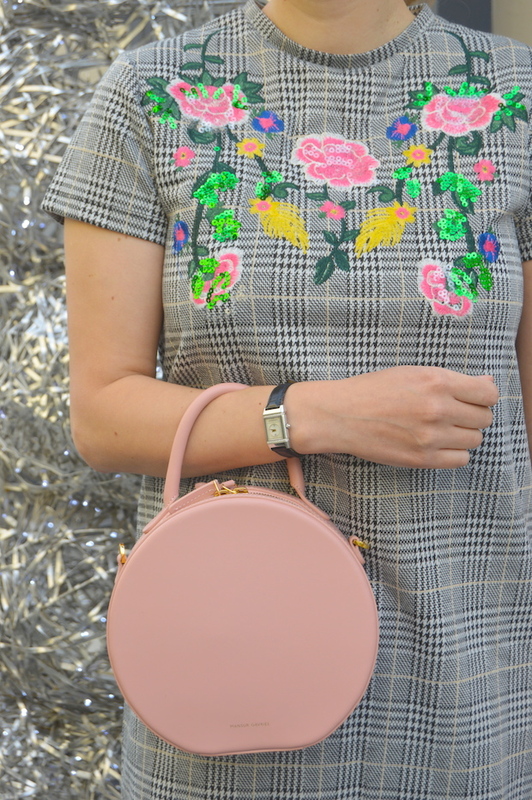 This embroidered flower dress from SheIn is really cute and could be worn for New Year's Eve but it's also very versatile, so it could work for most any day of the year! Because it was just a touch chilly the day I wore this dress and because the dress is also just a touch short on my 5'9" frame, just for reference, I decided to wear it with some opaque tights. In the future, I might try it without the tights or maybe with a leather jacket because it really is versatile. The other thing I love about this dress is all the lovely colors in the embroidery! The lovely colors take a simple black and white shift dress and turn it into so much more! Plus, if you look at the dress closely, you will see that there are actually some sequins in the embroidery, which give you just enough sparkle for New Year's Eve! I love the dress and those shades are so much fun! Love the dress. It is feminine, sophisticated, mod and unique. Great NY Eve look. Happy New Year Katie and keep inspiring us with your gorgeous style in 2018! This dress is so unique and I love the plaid and floral together. Your shoes are adorable and go so well with it! That dress is adorable! Very 60s mod and I love the plaid combined with the colorful embroidered flowers. A great look with the tights. It would look cute as a tunic top with leggings too.